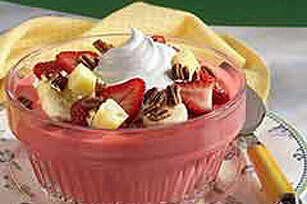 Red jelly blended with ice cream is chilled in a serving bowl and topped with bananas, strawberries, pineapple, nuts and whipped topping. Add boiling water to jelly powders in medium bowl; stir 2 min. until completely dissolved. Stir in cold water. Add ice cream; stir until completely melted. Pour into serving bowl. Refrigerate 3 hours or until firm. Top with fruit, nuts and Cool Whip just before serving. Prepare chopped toasted almonds or walnuts.